Ian Curr exposes the injustice of a 16-year-old Palestinian activist on trial for slapping an Israeli solider while defending her family's property. AHED TAMIMI, 16, is a Palestinian activist from the village of Nabi Salih. Ahed is on trial in an Israeli military court. The 12 charges against her include aggravated assault of a heavily armed soldier, threatening a soldier, preventing soldiers from carrying out their duties, incitement, disturbing the public peace and stone throwing. Ahed was defending Palestine and its people from occupation. A soldier trespassing into a courtyard (owned by the Tamimi family) on occupied land, in breach of international law, is not acting in the "execution of his duty". The video of the incident shows Ahed asking two Israeli soldiers to leave her courtyard, a soldier refuses, so she slaps him. Her mother, Nariman, comes out to give support and to make sure Ahed doesn't get hurt. In concert with her cousin, Nur Tamimi, and her mother, they push the two Israeli soldiers out of their yard. Israeli forces fired tear-gas canisters directly at the Tamimi home, which broke several windows. Moments earlier, Ahed Tamimi's 14-year-old cousin, Mohammad, had been hit point-blank in the face by a rubber bullet fired by the Israeli soldiers. Ahed was telling the soldiers "to get away from our home", her father, Bassem, said. She was trying to force them to leave to prevent the soldiers from hurting anyone else. That gives the young activist and her family the right to expel the soldier(s) from their property using appropriate force. The force used by the girl was a slap, a few kicks and some pushing by her mother and cousin accompanied by entreaties in Arabic for the soldier to respect their rights — their force is very mild. The soldiers eventually leave because they had no cause to be there, they were not investigating anything, they were a provocation, lounging in the family’s courtyard. During the exchange on the video (above, 2:11), a loud noise is heard like a weapon being discharged. Members of the family have been shot by rubber bullets, some have been detained, there is a pattern of ongoing harassment by the occupation army. 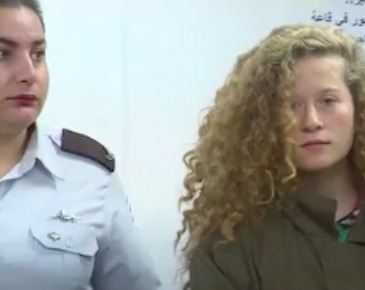 Ahed should not be guilty of assault, as she was merely exercising her rights. 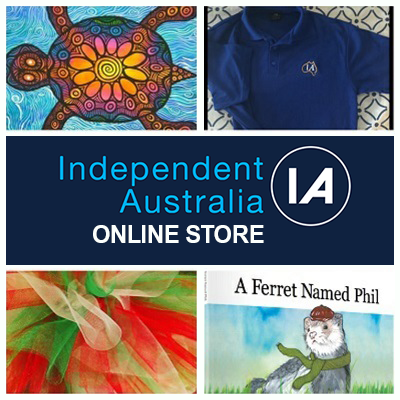 In Australia, we have some pretty draconian laws because, like Israel, Australia is a settler state. For example, our military assists the U.S. drone program in targeted assassinations in the Middle East. Resistance to the occupation in Nabi Saleh began when settlers from the adjacent settlement of Halamish seized a nearby spring and prevented the village’s residents from reaching it. Following the arrest and detention of the Tamimi women, on Friday, 12 January, there was an organised protest of 300 people in the village. So the occupation army closed the village declaring it to be a military zone. The proposed "two-state solution" by the United States, the United Nations and the Palestinian Authority has failed because it continues the occupation, with Israel building more and more settlements to displace Palestinians. Zionists wanted a Jewish State to defend Jews from racism like the Nazi Holocaust. Europeans gave them Palestine. The British had already collaborated with the Zionists in 1917. Only a couple of years after the bombing of the King David Hotel, the British administration fled Palestine. Since the UN declared the state of Israel in 1948, Zionists have created a state with walls, detention of children, nuclear weapons and so on. Nationalism and racism is no way to conduct human affairs. Indigenous Australians got by without it for 60,000 years. Why can’t "humane and civilised" Europeans learn from that? We need real tangible actions – not UN resolutions to be ignored by Israel – to take place. Support for Israel is waning and change must come soon. Perhaps a coordinated march on Jerusalem from all the supporters of Palestine may help achieve this. A highly coordinated international solidarity march from all border crossings – Lebanon, Syria, Jordan, Egypt – to increase pressure on Israel. There have been marches before, but not from all points of the compass, by land and sea. That would be a revolution – achieve real change – if nuclear-armed Israel were unable to stop a march on Jerusalem.